Are you looking to make a positive difference to your website? Would you like to reach out and engage with your customers online? Whether or not, there are many similar businesses as your own, you can still be involved with competition on a small or wide scale. You will find that you are constantly analysing your business strategy to see why you are not catching the eye. We are a branding and digital agency, yet we are part of a very competitive industry. Your company may be in the same position as us. To act on this we have been thinking of ways how we could reach further to potential clients. One idea was to create a live chat for our website. It is a simple quick way for customers to contact you and it improves customer service and loyalty. Is this something you would consider for your website? Still unsure? Below are a few benefits why it is considered as a great communication tool. Our chat feature that is located at the bottom right of the screen. You can start a chat with us by clicking the chat icon or the button below. If we are online you can chat with a member of the Emerge team. But if we are offline, please leave us a message and we’ll get back to you. Some people will find the option a quicker way of getting a response, as sending emails or using enquiry form can be perceived as a slow pace way of contacting. Also, not everyone likes to call up and speak to someone over the phone. Therefore, the feature creates choice. It is a benefit for both you and the customer, as you can both multi task. You can help the customer at the same time as carrying on with your work in the office. Also, you can rapidly respond to more than one person at a time, with several chats open. This is one of the major differences between a phone call and the live chat. A transcript is saved to your device of the chat. This is valuable, so you can refer to the copy for future reference. You can also analyse the chat to make improvements to your website or services. An effective way of doing this is by categorising each chat into different themes and then see if a theme occurs. For example, if you have analysed that a few customers are enquiring about the same certain information then you could use this as advice by making the improvements to your website. Therefore, the information is more accessible. Over time by categorising themes, type of customer, keyword or sales channel, it will enable you to prepare your website to help your customer base. Studies have shown that there is a high chance that your sales will increase. A study by American Marketing Association has shown that the live chat can increase conversions by at least 20%. Improved customer service and loyalty, as live chat is associated with fast responses, so the customer satisfaction levels are high. It gives a personal feel to the consumers that you care about them and are willing to help with whatever they need. Watch the video below to hear what the team at www.tawk.to think? 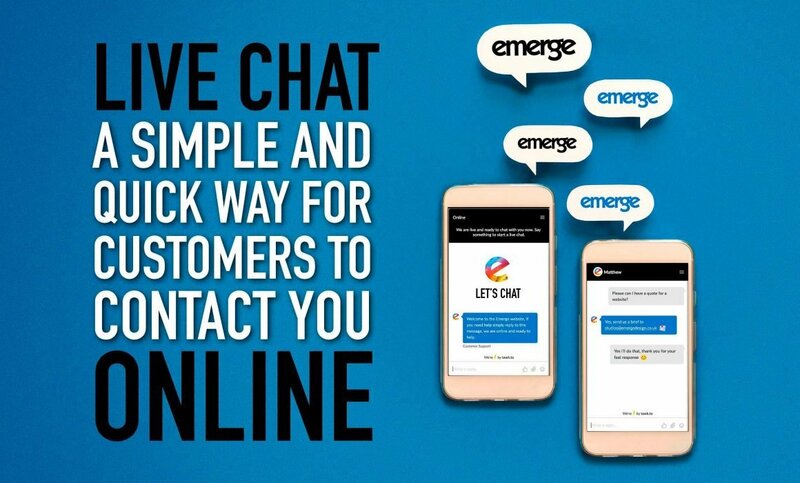 If you don’t have a live chat and are interested in installing one but unsure where to start, or you need some advice, then Emerge can help you – the benefits are great. Contact us so we can make a positive difference to your website and customer service. Chat with us, or email us at studios@emergedesign.co.uk or phone 01952 632750.